The convenient comments box has been abused by spammers so I removed it. Hello Guests, Post what is on you mind here so that everyone can read the words of a great mind. I think you don't like people who are never impressed with anything, because you know it can't be true that anyone has seen everything! And so it is an act. They're pretending that all has been done and they have seen before. It's rude and frosty and joyless when people have this transparent facade of insecurity. I felt compelled to comment on this because on your pet-peeve page you said you didn't know why this bothered you. just a suggestion. Also about the women crying bit? Some women are manipulative and can fake-cry about anything...most of us are crying because someone MADE us cry. Your proof of the existence of God is the best scientific proof that I have seen. If someone proves that 31 can be used to create prime numbers I will also became an Alphagorean. I really like your #402, 622 and 924 and your background images. Your music lacks drum beat but still like it. One of the best sites I visited so far this year. It was a delight to peruse it. What delightful site! I had so much fun reading through it and I must say it is by far the most interesting personal site I have ever seen! Ha Ha, sometimers I forget that Vas can be so funny! I loved the biography by the mentor, I loved the interview, and I loved all the quotes and thoughts both serious and ironic, the art and the links. Such rich and eclectic content. I'm inspired! If you verify alpha31 you should get the Nobel prize. Really liked your music and photos. Great site. Keep up the good work. Dear Mr. Gardiakos, Let me congratulate you on the mathematical proof of the existence of god. Document A presents the issues very clearly. Even if it doesn’t prove what you claim it does it will forever be the standard by which all future proofs must attain. I examined Document A and the highlights very carefully. From what I gather from the comments it seems that your detractors have not. In my opinion to satisfy even the staunchest skeptic including me: 1. Confirming Alpha 31 will greatly enhance your credibility. 2. You must prove that random numbers rarely have “oddities” similar to pi. But on the other hand I agree with you that pi is rather special. If I was god I would likely pick pi to announce my existence. 3. As you mentioned if a mathematician can create a more interesting number than pi in a similar manner as shown in Document A your hypothesis will be weakened. However I would demand that this contrived number must also have a relationship to two mathematical constants. This additional requirement will hamper even the most persistent mathematician I suspect. If you survive these three points you should get the recognition you deserve not only because in the thousands of years no-one else saw the oddities in pi but because you have answered one of the most important questions plaguing mankind. I hope that you succeed! Your website is the most interesting I have seen for a while. Good sense of humor. Nice background art! The idea that God communicates to us through pi is the dumbest thing I have ever heard. There is only one God but you need faith to understand this. To bad your “intellect” will not allow you to understand this. Hello, I dabble in number theory and found your proof of the existence of God very interesting or should I say odd. I have an equal fascination as you with numbers especially the prime series and the connection with extra terrestrial intelligence. I doubt that God would play with pi but on the other hand he created the universe so your proposition is not out of line. Who am I to say what God may or may not do however Document A has His fingerprints all over it. The question is, are the fingerprints authentic? A Prime number itself is irrelevant; the Importance of a prime number is the Nature of any and all prime numbers. A Prime Number is a continuum, infinitely divisible. If a Prime number is divided into two equal whole numbers there is a third element, a remainder, a Singularity of One that is central to all primary numbers, to all Continuums, such as the Space-Time Continuum, The Point of Singularity, the Singularity of Time Space and Motion, Motion that is without meaning, the nature of the motion of a Singularity of One alone in the emptiness that is central to the Relativity of Time and Space, Motion that is without angular momentum, displacement, without velocity of speed and direction, any given fixed moment, point, of Time and Space. It is indeed very interesting that pi has so many strange happenings or oddities as you call them. In the realm of possibilities the ball (oddities) must land on a blade of grass. In your case it landed on unique red blade of grass (pi). It seems to me that God guided the ball rather than circumstance. Liked your poetry, music and photos. Ardi did great job on your autobiography. I visited Kalamata in 1999 and had a great time. Too bad we did not meet then. Perhaps we will meet some other time. Your idea that God made pi to communicate to us is the stupidest thing that I have ever heard. You can find oddities in just about any number. Did you think of that? Why did you waist your time and now mine? WARNING TO ALL: STAY AWAY FROM THIS URL. Your website is definitely the most fascinating I have visited this year. Your proof of the existence of god seems very reasonable. I could not find any provable argument against Document A.
your art exhibits are more interesting than Pollock's. ... I have enjoyed your artwork and your thoughts. ... I hope you continue to do this wonderful artwork full of color and movement. It looks like music and a mathematical ocean floor, precise, yet touched by currents. How pleasing. Thanx for taking the time to check out my website [ www.daniel.mrgan.com ]. Glad you liked it. I visited your website as well. Very extensive and interesting. I really enjoyed your music. Let me know of any upcoming shows or Concerts? Subject: It’s a Prime that God exists! It's about prime! all intelligent life in the universe can become aware of its significance. Why are there so many prime numbers in pi? why the 3_ 4_ 5 Pythagorean triplet? why the 31-41-59 prime numbers? I have to say after visiting that site that it is total garbage. You could come up with those silly 'meaningful' numbers from any irrational number, its just the way they have been manipulated. For example. Why are there so many prime numbers?. Silly question. Ignoring the zero there are 4 primes from 1 to 9, in other words 44%. In the first 20 digits of pi there are 9 primes which is 45%. What makes you think there are 'so many primes'? You ask "why the 3_ 4_ 5 Pythagorean triplet?" The answer is why not? The numbers are not in that sequence anyway, you have to ignore the numbers in between! How daft is that. So what if the numbers 3, 4, 5 appear in that sequence, as they must somewhere no end of times, so what? You think that means God exists! You clearly do not have any idea about statistics. Sorry, but your argument is just plain daft. Thanks you for taking the time to write. 25% of numbers under 100 are primes. But three primes in a row? See #2 and #5 below. You could come up with those silly 'meaningful' numbers from any irational number, its just the way they have been manipulated. Keep in mind thought that pi is not any irrational number but the most popular constant. I certainly did not manipulate pi. God did. I assume you mean that I somehow I picked and highlighted only what ever looked interesting? That is exactly what I did! I picked the interesting and ignored the mundane. These were randomly typed by me separating the first ten digits. Is this what you mean? Are you perhaps saying I see patterns that are not there? Perhaps the patterns are there but not proof that God manipulated pi? Here: 83513943593853513243683. Hint: 3. Again just curious. This proves that I can take any random number and make a pattern. it is _3_1_4_1_5_9_2_6_5_3_5_8_9_7_9_3_2_ = the starting digits of pi. These examples of patterns are not significant because the numbers are random but the patterns are my doing. Now if they were part of an important constant one could think otherwise as random numbers generally do not produce these oddities. The mathematical and geometric fabric that God weaves does not use the same mathematical symbols and conventions as we use. The fabric is ingeniously woven by God to not only get attention (3_4_5) but to also encourage us to examine it further. One must occasionally think outside the box. Look at reality from a fresh angle. Sometimes one must read between the lines or ignore them as 3_4_5. 2) In pi, 31, 41 and 59 are primes (3.1 41 59...). No formula has been discovered that will produce all the prime numbers however 41 + n squared + n and 59 + 4n squared + 4n are two of the most productive formulas known to yield prime numbers. Has 31 been overlooked? After all 314159 is a prime. See 5) bellow. The great mathematician's Leonhard Euler's formula 41 + n squared + n turns out to be surprisingly good for large values of n. A computer showed that for the primes under ten million, the formula generated primes 47.5 percent of the time. The formula works even better for lower values of n. For values of n under 2,398, there's' an even chance of getting a prime. And for values under 100 the formula yields 86 primes and only 14 composite or non-prime numbers. For n=0, the formula yields the prime number 41. For n=2, the prime number 47. Indeed, as n takes on successive values from 0 to 39, Euler's formula yields nothing but primes. Stanislaw Ulam, a well known and respected mathematician and his coworkers discovered another prime generating formula that is almost as good as Euler's. The formula 59 + 4 n squared + 4n has a success rate of 43.7 percent. 3) In pi, 31, 41 and 59 are the 11th, 13th and 17th primes. Very oddly 11, 13 and 17 are consecutive primes. Oddly 1+1+1+3+1+7=14 and 11+13+17= 41 (3.14159...). In 11, 13, and 17, 1+1=2, 1+3=4 and 1+7=8 a 2-4-8 progression. Also 31+ 41+ 59=131 and 3+1+4+1+5+9= 23, both sums are prime numbers. 4) Pi starts with the prime number 31 which is also a Mersenne Prime. The cube root of 31=3.141380652 which is within .00675% of pi. The first 8 digits of pi 3+1+4+1+5+9+2+6=31 also 1+4+1+5+9+2+6+3=31. There is no zero in the first 31 digits of pi. Note, 1+2+4+8+16=31 and (from 16=31) 16x31=496. The third perfect number is 496. 5) Pi starts with 314159 and its mirror image 951413 are both prime numbers. How many more mirrored primes exist in pi? The first even number in pi, 314 divided by two equals 157 which is a prime. Also 14, an even number divided by two equals 7, a prime. 6) Pi = 3.14159265358979323... It is very odd that a group of eight small different contiguous primes: 3, 14159, 2, 653, 5, 89, 7, 9323 are right at the start of pi. Many and possibly infinite small (numbers with five or fewer digits) and large (greater than five digits) different contiguous primes may exist after "9323". It will be interesting to see how many digits the average contiguous prime has. Perhaps more interesting may be to find how scarce are groups consisting of eight small contiguous primes of which none of the prime numbers are duplicated. 7) Starting with the first digits in √2, 1_1_2_3; S, 8_6_2_9 and in pi, 2_5_4_3 (3_4_5_2 inverted) are prime numbers. This proves that someone very powerful namely God, Has manipulated pi therefore He exists. The Search for Extraterrestrial Intelligence has finally yielded results. The first ETI was discovered not from any dish but from Pi. There are several prime number oddities in pi that prove the existence of an advanced ETI namely GodA or ETI-A. Pi is the most popular universal constant and therefore all intelligent life in the universe can become aware of its significance. Why the 3_ 4_ 5 Pythagorean triplet right at the start of pi? Why three contiguous prime numbers, 31-41-59 right at the start of pi? Besides being primes what is so special about 31-41-59? Please forward this message to your email friends, blogs, forums and news groups. Thanks you for taking the time to write. You are right the pi oddities are absent from the base of eight. The pi oddities are also very likely absent from most of the other of infinite base notations other than ten. There is a reason why we have ten fingers. Why am I me and not some one else? I wish I had the answer to that. The first time I asked myself that question I was 9 years old and lying on my bed in the middle of the afternoon in a half-awake but acute state of self-awareness. It's a recurring question and one that I revisited only a few days ago. I have never heard (or seen) it asked by anyone until I visited your site. In fact I have always wondered if others ever asked it! I just spent the the better part of a day at your site and, yes, I had other things to do, but nothing more fascinating than that. I wish I could say I took the above shot but I didn't. 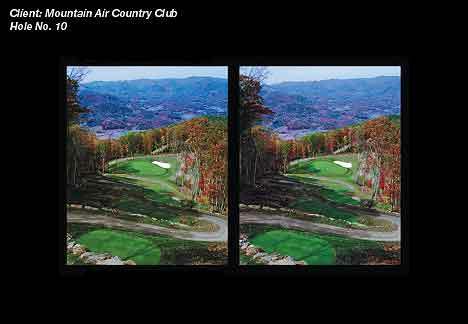 A single view was supplied by our client and I turned it into a stereoscopic pair using Photoshop. It's a tedious process but a lot of fun. Here is a shot that we did photograph, however, using two 35mm cameras mounted on a single tripod that we fitted with a long piece of metal drilled with a number of holes so that the cameras could be separated at different widths from each other depending on the scene and the distance to the closest thing in the foreground. I've since forgotten the formula. Can you free view? If so I'll send you a few more. 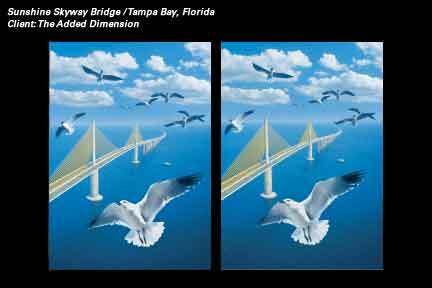 Since the death of both my partner and our 3-D client, Jim Curtin, I haven't done any 3-D. I've always wanted to try out lenticulars on some of my art images but the cost was too high for something that large (32x40). I notice that you mention it on your Keywords page (on which, btw, I found a number of other synchronicities :-). Have you used the process for art, advertising, or both? I would love to see some examples of your work. What is your interest in math, science and philosophy? Sorry I hadn't seen this one I just looked at the picture and this was something I came up with and I wanted to send it to you in case it was missing. I came to your site while searching for answers in the web what pi squared does really mean. browsing across thousands of websites I came to your site. I found it fascinating because I'm thinking in the same way. God must be somewhere in these numbers. I'm doing a lot of physics these days as my hobby for fun but I more like searching through all the concepts of physics if there is something new to explore I really do know that all these constants represent what our universe is made of and we do not really get the meaning of them but what I can tell you from my experience from my research is: all these numbers are connected and in direct relation to each other. Very interesting that pi is in an equation that includes gravity. Yes, We Are Being Recorded! Using computer terminology, gravity is the hard-drive of the universe. In our universe I suspect that the cosmic memory is stored in gravity. Not likely that we are being recorded for a cosmic power to examine us but out of necessity for the stability of our universe. The size of each atom is not tiny as we normally think that they are. Each atom is actually the size of the universe. Its sphere of influence fills the complete universe. Its influence radiates outward from the atom having an effect on all phenomena including each every other of the nearly countless other atoms in the universe. This influence distorted by all the other atoms and phenomena then returns back to where it started. Hope to expand on this subject in the future. I came to your site while searching for answers in the web what pi squared does really mean. browsing across thousands of websites I came to your site. I found it fascinating because I'm thinking in the same way. What does pi squared really mean. This has never crossed my mind but would be interesting to hear your thoughts on th subject. God must be somewhere in these numbers. In my way of thinking God specifically numerated pi so that the oddities would be convincing evidence that He exists. http://www.artmusicdance.com/vaspi/highlights.htm On the other hand if no-one believes that Document A proves that God numerated pi that included oddities detectable by intelligent beings then God made a bad error in judgment about us. Perhaps sometime in the future it will be accepted? Sorry that I can only communicate in English and thankful that you comprehended it and can reply. Just visited your website, and it is very interesting that you have art and music. Your compositions sound very hypnotic, and your art is like your music. Very layered. I was glad to receive your comments. I also have wondered if anything can truly be random. I am however not sure where you are taking this thought. Also uncertain of the meaning of "This means that if one (or God, or whatever) were to pick a number randomly, the probability that number would correspond to a computation is identically zero." Please explain. That sentence is just restating a property of probability theory. That is, the probability of randomly picking a rational number from the set of real numbers is zero. In other words, if you put all the real numbers in a hat, and "randomly" reached in and picked out a number, that number would always be irrational, even if you kept repeating forever. The reason is that there are so many more irrational numbers than rational numbers. 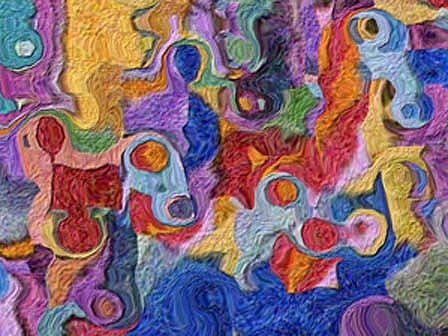 In the same way, there are so many more irrational numbers than there are computations according to our model of what constitutes a computation (every different computation can be assigned an integer, so there are only as many computations as there are integers -- an infinite number, but only countably infinite, whereas the reals are uncountably infinite). Do you follow? Thanks for the link! It looks like a good site to check in with daily. I don't have a website of my own, and the only links I check with any regularity are things like news.bbc.co.uk, or news.google.com. I have recently gone back to school (I'm 43). Right now I'm a student at a community college, studying documentary production. Some day, I'd like to take on something big, like a documentary exploring the similarities and differences between science and religion. But I found your site because I'm also just beginning music lessons, and I was doing searches into the mathematical foundations of music. I liked your article! I wish you the best with your documentary production major. I personally prefer documentaries over movies. Science and religion? good luck. I believe in proof not faith for important issues and the existence of God is an important issue for me and hence Document A. Faith is the antithesis of proof. Not sure how much of my site you have visited but keep in mind any criticism and suggestion from you will always be appreciated. Looks good Vas I'm still working on mine. Hi, Vas . . . I checked out your website as well which is much more sophisticated and active than mine is. I enjoyed listening to some of your pieces of music and seeing your art, etc.. What a versatile and talented person you are. Copyright © 2007 by Vasilios Gardiakos - All rights reserved.